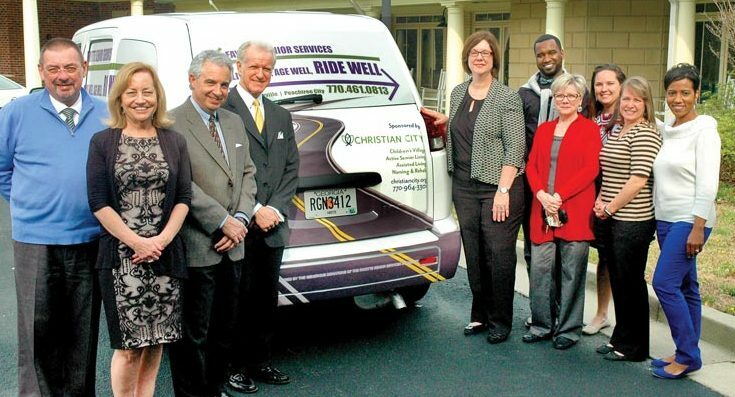 Christian City recently co-sponsored a new Fayette Senior Services (FSS) van used to transport seniors who no longer drive to doctor appointments, dialysis treatments and pharmacy prescription pick-ups. Pictured from left are Jeff Wix, FSS Transportation Manager; Nancy Meaders, FSS President & CEO; along with Christian City leadership and staff including Len Romano, President & CEO; Ken White, Director of Home Sales & Resident Programs; LaVann Landrum, Chief Development Officer, Herschel Willoughby, Hospice Community Relations; Connie Hall, Volunteer Coordinator; Hannah Haddock, Home Care Community Relations; Beth Campbell, Assisted Living Admissions Director; and Rosalyn Lett, Skilled Nursing & Rehab Admissions Director. Photo/Christian City. If you’re like most people who live or work on the south side of metro Atlanta, you have heard of Christian City. Some know about the 52-year-old nonprofit’s mission to care for abused and abandoned children, while others know Christian City as a faith-based senior living community. To celebrate newly completed renovations to the Assisted Living Center and Skilled Nursing & Rehabilitation Center, Christian City is hosting an open house on Thursday, March 16, from 4 to 7 p.m. The public is invited to attend. Guests will enjoy hors d’oeuvres and guided tours of the main floor of the Assisted Living Center and Skilled Nursing & Rehabilitation Center, located at 7300 Lester Road in Union City, just 9 miles south of Hartsfield-Jackson International Airport. A short program will be presented at 5:30 p.m. Please RSVP to Beth Campbell at bethc@christiancity.org or 770-355-5766. For more information about Christian City, visit christiancity.org. On land donated by Dr. Byron and Rose Marie Harper, Christian City has grown far beyond the original ministry started by a group of dedicated individuals associated with Christian churches in the area. Opened in 1965 on Valentine’s Day, Christian City began with one cottage for eight boys in need of a safe and loving home. The campus now covers 500 acres and is home to nearly 1,000 senior adults in addition to the Children’s Village, which includes four family-structured homes for 32 children ages 5-17. In 2017, Atlanta Business Chronicle ranked Christian City in the top 100 nonprofit organizations in metro Atlanta. Only three CEOs have led Christian City over the past five decades. Bob Puckett and Bob Crutchfield each served more than 20 years at the helm before Len Romano came on board as president and CEO in December 2015 after a 34-year career with YMCA, most recently as CEO of YMCA of Greater Omaha. Working with the 27-member volunteer Board of Trustees, Romano has developed strategic goals to plan for the future of Christian City. Over the past year, a development study, rebranding effort and website redesign have been completed. “Christian City has evolved over the years from its start as a children’s home to its current mission: to extend Christ’s call to love your neighbor through housing, healthcare and crisis intervention for children, families and older adults,” Romano said. “Christian City envisions a world where the most vulnerable among us have a safe home and loving community, which enables them to thrive,” he said. Collaborations with other non-profit organizations serving the community, such as Fayette Senior Services, Coweta Community Foundation, Clothes Less Traveled, Midwest Food Bank, Southside Rotary Clubs, Fayette Chamber of Commerce, and Newnan-Coweta Chamber are helping Christian City more efficiently and effectively serve children, seniors and families. House parents of today and yesterday stay in touch with the hundreds of children who came to live at Christian City over the years. They delight in their visits in person and enjoy seeing social media posts about their “kids” who are now adults with families of their own. A 2015 high school graduate recently said, “If not for my house parents, Mom and Dad Cater, and the Children’s Village, I don’t know where I would be. They were our real family.” He is now working part time at a hospital and attending college pursuing a degree in physical therapy. “I don’t know how I could ever repay the Caters for what they did for us. The only thing I know to do is to try to make something of myself. They taught me to let my past be my past, and to not let it define my future,” he said. Just as the community need for a children’s home was fulfilled in the mid-‘60s, the need for active senior housing and a convalescent home in the area was fulfilled at Christian City in the late ‘60s and ‘70s. Construction of an assisted living center and subsidized senior apartments followed over the next two decades. Christian City was ranked in 2017 as the 4th largest retirement community in metro Atlanta by the Atlanta Business Chronicle. While many of the first retirees to relocate to Christian City had lived on the south side of metro Atlanta their entire lives, seniors moving to Christian City today are coming from all over the country. 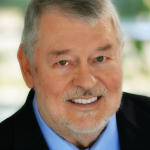 Proximity to the Atlanta airport is a draw for those who enjoy traveling in retirement. Margaret Speir, a patio home resident at Christian City for 35 years, moved from Mountain View, which is the present location of Hartsfield-Jackson Atlanta International Airport. She recently celebrated her 100th birthday. “We chose our home based on the location, but now we love it because of the people,” said Speir’s neighbor and 11-year resident, Beverly Bryant. In 2009, Christian City partnered with Pruitt Health to operate the Assisted Living and Skilled Nursing & Rehabilitation Centers owned by Christian City. With the addition of Pruitt Health’s on-site pharmacy, home healthcare, and hospice services, the full continuum of care for seniors was made complete at Christian City. Its most recent assistance is as one of the sponsors of a new van operated by Fayette Senior Services to transport seniors who no longer drive to doctor appointments, the pharmacy, etc. As a part of the sponsorship, new Christian City branding is displayed on the rear of the van. “A fresh green color palette and the theological symbolism of the fish in the brand mark are two highlights of our new branding,” said Rhonda Silvis, director of Marketing and Communications. “Christian City’s promise is to provide life-changing hope through faith, community and care. Our new brand speaks to that promise,” she said. PHOTO above — Christian City recently co-sponsored a new Fayette Senior Services (FSS) van used to transport seniors who no longer drive to doctor appointments, dialysis treatments and pharmacy prescription pick-ups. Pictured from left are Jeff Wix, FSS Transportation Manager; Nancy Meaders, FSS President & CEO; along with Christian City leadership and staff including Len Romano, President & CEO; Ken White, Director of Home Sales & Resident Programs; LaVann Landrum, Chief Development Officer, Herschel Willoughby, Hospice Community Relations; Connie Hall, Volunteer Coordinator; Hannah Haddock, Home Care Community Relations; Beth Campbell, Assisted Living Admissions Director; and Rosalyn Lett, Skilled Nursing & Rehab Admissions Director. Photo/Christian City.